Your uterus now reaches at least to your navel or in some cases slightly above. Maybe your navel is slightly higher up on your belly. The midwife takes this into consideration when she is checking if the uterus is growing well. It can also happen that the navel protrudes out from the belly and becomes thicker although this is not always the case. 24 weeks pregnant – how is your baby growing? Your baby is now approximately 31.5 centimetres long and weighs about 550 grams. 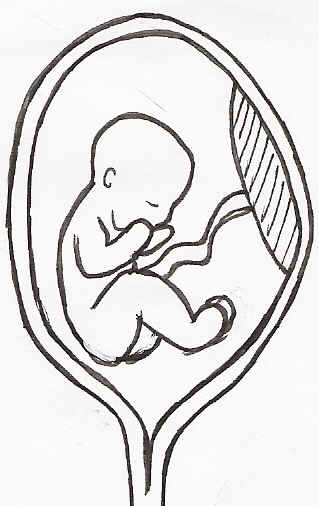 In this period the baby settles into a favourite position. Often after the delivery you see the baby resting in this position. The baby continues to swallow amniotic fluid to exercise the lungs. Sometimes he may choke on it and get the hiccoughs. Often this is felt as a rythmic beat in your belly. Your pregnancy in week 10 with the growth of your baby.